While people could find the text and perhaps a photo with this story online, reading it as it was “packaged” “above the fold” on page A1 of Wednesday’s San Antonio Express-News was part of its appeal. SAN ANTONIO– Call me old-fashioned. But I took special delight in reading San Antonio Express-News‘ Mike Monroe’s front page story Wednesday about WNBA All-Star Becky Hammon being selected as the first female paid assistant coach in the NBA. 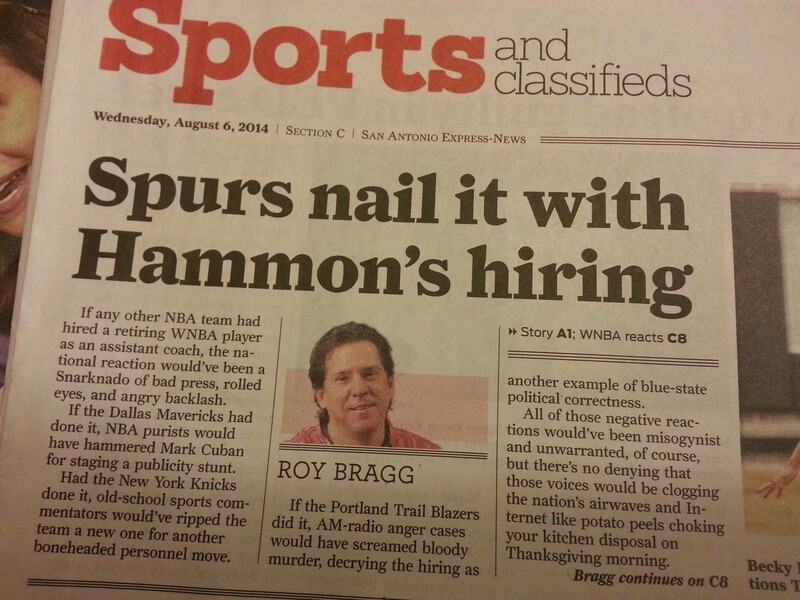 The announcement of Hammon’s hiring by the San Antonio Spurs made national news. The historic nature of her hire makes it a national news story. But, the national media coverage (i.e. Andrew Keh’s story buried on page B13 of The New York Times) of it does not compare to the way the story was played in the paper in the hometown of the Spurs. Along with the front page story that included more than the expected quotes and statement from yeah management, there was Terrence Thomas’ “reaction piece” featuring Hammon’s female teammates and a perspective offered only by Roy Bragg, who’s been a Texas journalist for more than 30 years. Those other related stories were in the SPORTS section of the Express-News. On page A2, the paper promotes “Tomorrow’s front-page stories now available at 10:30 every night, exclusively on ExpressNews.com. I discovered veteran sports journalist Roy Bragg’s work while reading a print edition of The San Antonio Express-News Wednesday. Why was it important for me to read this piece Tuesday night? I’m not sure SPEED was the motivation for me to know the story. The perspective that only this publication provides is reason enough for it to land on my front step the next day. And, I know the issue is not one of medium, but reader preference. The business model doesn’t work if people like me are in the shrinking smaller and smaller minority. But, daily newspapers all over the country are hastening their demise by making their product harder and harder to find. The absolute shame is that I had to go to three locations just to find the publication. At my hotel, I was told the Express-News delivers so few copies that if you don’t come to the gift shop within 1 hour of it opening, the papers are gone. What’s wrong with this picture? Is the Circulation Department at The Express-News that afraid that they will have leftover papers, so they don’t deliver many copies so they sell out in an hour? Why not deliver 3 times as many newspapers? I know when I’m on a plane or sitting in a restaurant, I’m usually the only one turning the pages of a newspaper while others are tapping away on their smart phones or tablets. So that explains why this Hearst newspaper, traditionally one of the four largest papers in the state of Texas, is hard to find. They say All Politics is Local. I enjoy reading about those politics when I visit a town in the local paper, especially when it has a national reputation. The story in Wednesday’s Express-News about a controversial proposal to increase the storm-water utility fee was interesting to me. It was “packaged” along with a column by David Hendricks on the BUSINESS page. But, reading the local paper has an appeal that will never be replicated in an e-edition or on Twitter or some other electronic means.